Lake Erie How Was It Formed? Lake Erie was formed during the glacial period when huge ice sheets moved from Canada towards Ohio. These glaciers scratched the bedrock and their enormous weight created deep depressions. Melted ice then filled the depression shaping the Great Lakes. The lake holds the title as the shallowest of the Great Lakes. The shallowest part of Lake Erie is at 25 feet in the western basin, 61 feet in the central basin and 120 feet in the eastern basin. Because of the uneven footbed, vicious storms often occur in the shallow basin of the lake. Also, Lake Erie yields more abundant varieties of fish than the other Great Lakes. The yearly catch in Lake Eerie equals that of all Great Lakes combined. The lake's warm temperatures produce greater numbers and varieties of fish than any other Great Lakes, including channel catfish, smallmouth bass, walleye, white bass and yellow perch. North Bass Island is the second largest land in the northernmost part of the Bass Island. It sits in Lake Erie Island in Ohio and part of Put-in-Bay Township of Ottawa County. It is located 18 miles from central Ohio and just 2 miles from the Canadian border. Manila Bay sits on the southwest corner of the island along with an unnamed creek that extends from the bay. The island is one of the few remaining island left untouched with commercial development. The state of Ohio purchased the 589 acres (2.4 km2) of land out of the 688.9 acres (2.79 km2) to preserve it. Also, authorities operate the island as North Bass Island State Park. Isle Saint George, a small independent community lies within the island. As of 2007, the island houses two dozen permanent residents in 12 privately owned estates. In the past, North Bass was mostly vineyard. South Bass Island is located at the southernmost part out of the three Bass Islands in Ottawa County, Ohio. It rests on a small island west of Lake Erie and 3 miles (4.6km) from it south shore. Moreover, the island is a popular destination for recreational activities. The island is approximately 3.7 miles (6 km) long and 1.5 miles (2.4 km) wide. 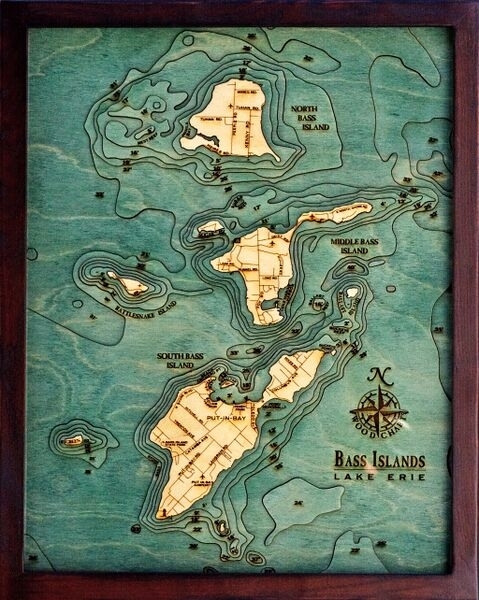 South Bass Island covers 1,588 acres (642.8 hectares) of land. An airfield is built in the southwestern part and a residential community on the northeastern side. As of 2000 census, the island houses 631 permanent residents. Also, South Bass Island often called as the ‘Key West’ of Lake Erie because of different activities it offers. The island also boasts of historical monuments such as Perry's Victory and International Peace Memorial honoring the Battle of Lake Erie. The island serves as the annual host for the Inter-Lake Yachting Association race called Bay Week.